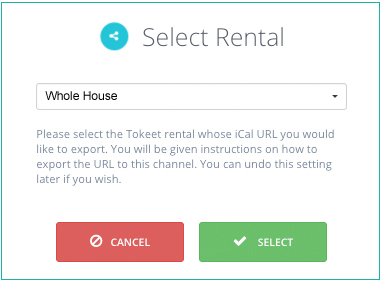 You may occasionally need to link Rentals together in Tokeet. Let’s say you have a House with Room 1 and Room 2. You would like for House bookings to block calendars for Room 1 and Room 2. You will export a calendar for the House and import it into Room 1 and into Room 2. Configuring this is easy in Tokeet. 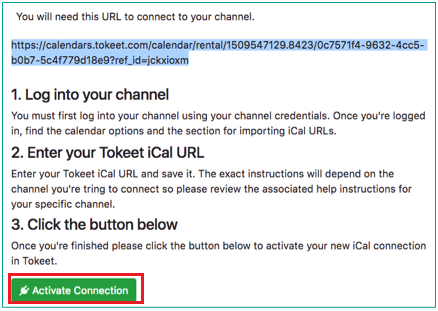 In the Export section, click "Add"
Choose a Rental from which you are exporting the calendar and click "Select"
In the popup, scroll down and copy the Tokeet calendar URL, then click "Activate Connection"
In the Import section, click "Add"
Paste the House calendar URL you copied from part 1 of this guide. Now, repeat the Import process for Room 2. 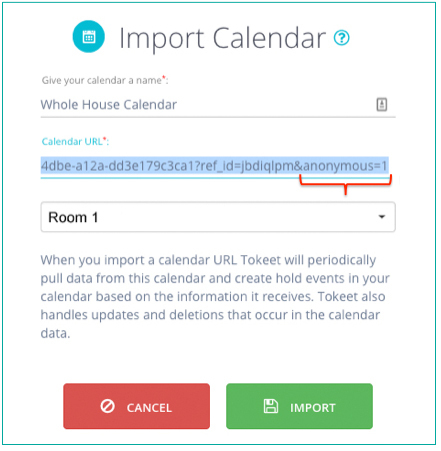 As a reminder, you will want to append &anonymous=2 to the calendar URL being imported into Room 2. That's it! Any events on the Whole House calendar will now block the calendars for Room 1 and Room 2.